We are continually updating our web site to offer you the most up to date, popular, and useful church goods and religious articles available. Our goal is to retain our "old school" approach to customer service, mixed with the newest technology to give our customer the best of both worlds when it comes to your shopping experience. Currently, our web site is continuing to evolve to serve your needs as efficiently as possible. If you should experience any problems, or have questions pertaining to your shopping with us, we will be more than happy to help you in any way that we can. Each year we put together what we believe to be the most comprehensive, church goods, catalog in the industry. Now all 576 pages are available to be viewed online. Our new site will include an easy to read table of contents, zoom features, and search functions. Once you find exactly what you are looking for, our friendly, knowledgeable staff can take your order, offer advice, and help you in whatever way you need. After a century in business, a satisfied customer is still our most important goal. Please come visit our store in Louisville, Ky. We welcome our customers, and would love to meet you in person. Our staff is here to help in any way that you need; from taking measurements for finding the perfect fit for your dalmatic or chasabule, or to help make suggestions for last minute religious gifts suited for any occasion. We have enjoyed making personal relationships and friendships with our customers for over 132 years. We publish the most comprehensive catalog in the church goods/church supply industry. For over 100 years,Tonini's has supplied you with the best products and service. Now we can serve you online! Tonini.net is your one-stop, complete church goods and religious gift store. Now with over 18,000 items available through our online store, we have something for everyone. 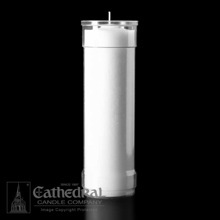 Browse through our large selection of candles. 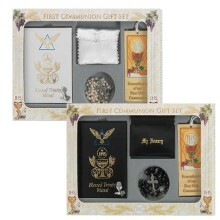 altar breads, sanctuary supplies, clergy shirts, and first communion gifts for a sampling of what Tonini's has to offer. You will be sure to find the items you need at prices you can afford. We continue to enhance our site regularly with new merchandise and product details, so visit us often. Please let us know if you encounter any problems. Your feedback is very important to us. If you can't find the item you need, or if you prefer personal assistance, please contact us. One of our friendly sales professionals will be happy to assist you. 100% pure concentrate. For use on Holy Thursday. Available in two sizes: 1 OZ. or 3.3 OZ. 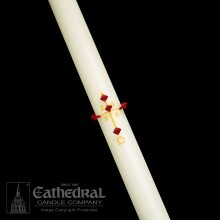 This bold yet elegant 51% Beeswax Paschal candle features a gold cross ith red wax nails. Comes with date. Available in a variety of sizes to meet your needs, including matching side candles. 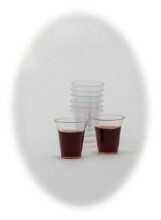 "Thee Friendliest Cup" New made of corn 100% Biodegradable plastic communion cup. 1 3/8" Height, Traditional size of RW-77. Clear crystal color. Made in the USA. Sold 1000 per package. Available in 500 (ART-85) and 2000 (ART-88). 100% compostable. A premium quality Greek Rose incense. A rich, familiar fragrance of rosemakes this one of Ekklisia's most popuar choices. 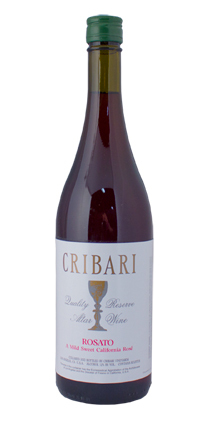 Holds an aroma of floral and a pleasing hint of spice. Available in either 1 pound tin or 1 ounce poly bagged. 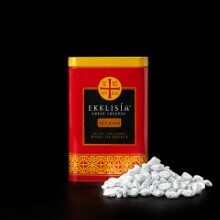 Ekklisia Incense is made in Greece using only premium frankincense resins and the finest aromatic oils. Each batch is carefully blended, pressed, hand-cut, and then cured to create a rich, long-lasting fragrances and an unmatched smooth-burning quality. For centuries the monastic communities of Mount Athos, Greece, have made a unique style of incense recognized around the world for its superior quality and transcendent aromas. E-Z Task Candle Wax Remover is a Tonini exclusive product. For years customers have found hundreds of uses for this outstanding remover. 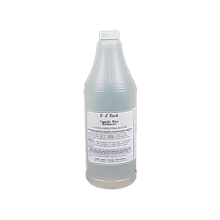 Removes wax from Altar Linens, clothing, carpet, furniture, metal ware, and many other applications. Available in Gallon, Quart, or 8 Oz. Bottle. Find your own new uses today. Dealer Discounts available, please inquire through contact us for pricing and other information. 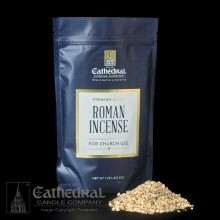 Premium quality Greek Myrrh Incense. The classic and traditional scent of myrrh. 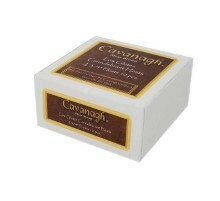 A warm and earthy aroma with subtle notes of leather and vanilla. Available in either 1 pound tin or 1 ounce poly bagged. 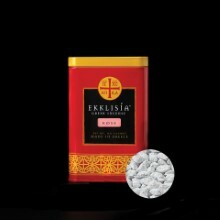 Ekklisia Incense is made in Greece using only premium frankincense resins and the finest aromatic oils. Each batch is carefully blended, pressed, hand-cut, and then cured to create a rich, long-lasting fragrances and an unmatched smooth-burning quality. For centuries the monastic communities of Mount Athos, Greece, have made a unique style of incense recognized around the world for its superior quality and transcendent aromas. Host packaged in heat sealed plastic tubes to ensure freshness. 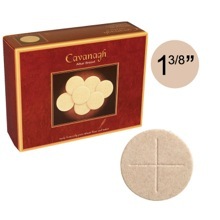 These small diameter (1 3/8"), Whole Wheat Altar breads by Cavanagh are baked in strict conformance to the spirit and letter of Canon law using only pure wheat flour and water. 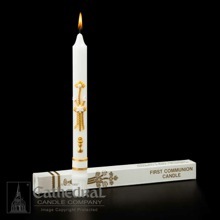 First Communion Candle 7/8" x 10 1/4"
This Altar Pure Liquid Paraffin by Lux Mundi is 99.4% pure paraffin for use with ALL refillable oil-burning candles. Altar Pure paraffin burns cleaner and brighter than the competition at HALF the price. 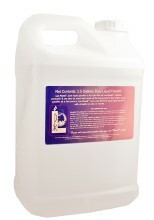 Available in quart, gallon, or 2 1/2 gallon container. 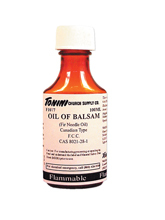 For use in Refillable Candles and Canisters. Includes: Leatherette Missal, Rosary, Deluxe Rosary Case, Bookmark, Scapular and Pin. Leatherette Blessed Trinity Missal Deluxe Edition is a perennial favorite. 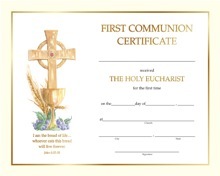 The Blessed Trinity Missal has enriched the spiritual lies of countless First Communicants over many years. 176 Pages that contains a Mass, popular Catholic Devotions, Daily Prayers, Inspiring Saints for children, the Rosary, Stations of the Cross and more. 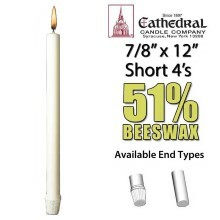 Short 4 Altar Candle 7/8" x 12"
Our 51% beeswax candles are expertly crafted using only the finest pure natural beeswax for longer, cleaner, and more dependable burning performance. Available in Plain or Self-Fitting ends and a variety of lengths. Our warehouse is fully stocked for fast shipment. Cathedral Candle 10040106 and 10040006 numbers.